An initial network is produced and trained using every row from the First to the Last. Another network is produced and trained using the rows from the Start and then with all the following rows up to the maximum. A copy of the row being forecast and a new row are added to the end of the grid. The new row has the forecasted values. This allows the forecasted values to be compared with the actual values. More than one forecast can be produced at every step. The process continues until the maximum steps is reached. When the process stops the grid is returned to its original state without removing the added rows. A secondary copy of the grid can be saved along with the secondary network. The total number of rows in the grid. All rows are counted. The first row in the grid to use for training the primary network. The last row in the grid to use for training the primary network. The first row to use for forecasting. 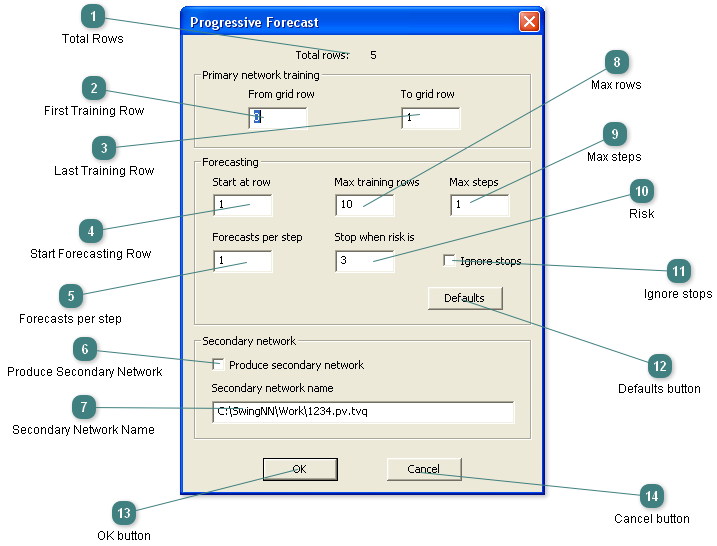 The number of forecasts to be produced after each step. Check to produce a secondary network. The file name of the secondary network. The maximum number of rows to use for training at each step. The maximum number of steps. Forecasting will stop if the risk level is exceeded and cannot be reduced. Check to ignore all stops during progressive forecasting. Click Defaults to set all the dialog controls to their defaults settings for the grid. Click OK to accept all the settings and close the dialog. Click Cancel to reject all the settings and close the dialog.